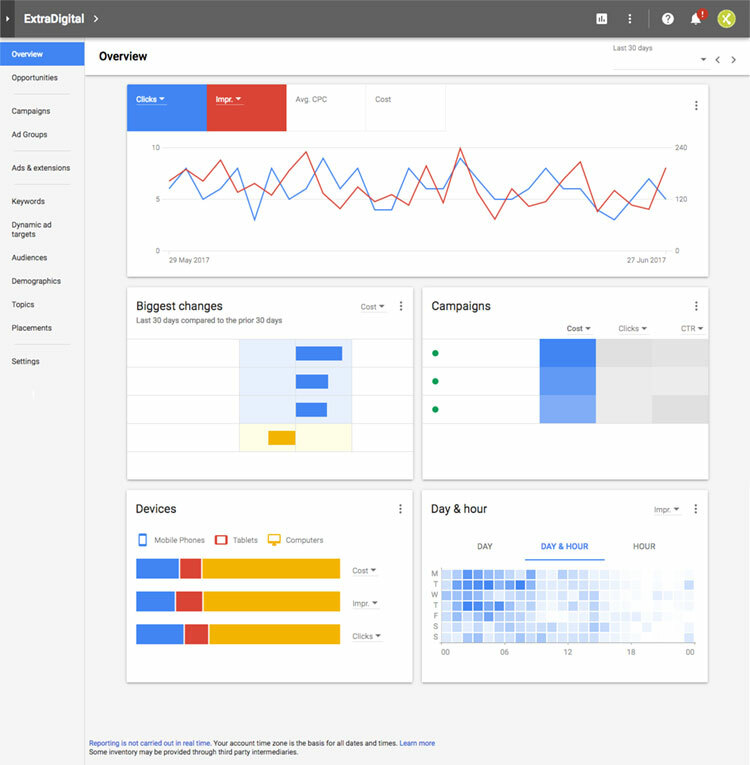 Google has rolled out a new AdWords interface or dashboard. It is helpful for some types of analysis, but loses some useful information. The new AdWords experience shows three dots instead of the gear and the interface does look a bit different. To switch between experiences simply go to settings and change which version you want to use. How you manage your PPC campaigns isn’t going to change so you can still do this the same way. What you can do is find useful insights quickly using several predefined reports to speed up checking and performance analysis. In addition, the API and Editor haven’t changed so you can still use these the same way too. You can customise and improve the overview to give you better insights into your campaigns. This page uses a selection of cards featuring insights and performance highlights. Google plans to make more cards available in the future to give us, even more, insights into our PPC campaigns. In addition, you can add reports to your dashboards and easily share these with collaborators. Plus, change history has been updated to help with diagnosing and fixing issues. These ads let you group together related products and present them together to showcase your brand and are only available in the new AdWords experience or AdWords API. The ads appear on Google search and include either a suitable image or product image to match the search term. When the ad is clicked it expands revealing the chosen products. You can advertise a few products right up to a whole category. Now you can review both your text ad copy and related ad extensions together to make sure they make sense. This not only saves you time but allows you to be more creative and less generic in your ad creation. The main benefit is to make is easier and quicker to manage campaigns. The new interface is designed to be more intuitive giving you suggestions to better achieve your goals. Also, it should be quicker to review and adjust data like bids. A word of caution, as helpful as Google’s new interface is never forget that Google’s goal here is to get you to spend money on AdWords. While often that means you get tools and systems to maximise your campaigns occasionally the emphasis can be on spending more not spending wisely. 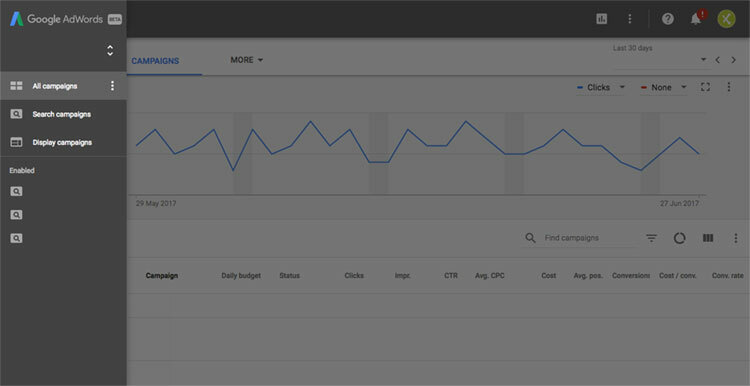 Using the new AdWords experience to create winning campaigns that maximise the budget improves marketing results. Struggling to get the best from your PPC campaigns, talk to us. With expert, Google qualified PPC managers we can get your campaigns in shape generating leads and sales. *Recommended click budget client spend starting from £1k per month. Call now or complete our contact form below for more details.